Welcome to the campsite restaurant Les Myrtilles in Saint Nicolas des Biefs ! Campsite with pool and WIFI connection in the Allier. In Auvergne, between Vichy and Roanne, on the heights of the Monts de la Madeleine, near la Loge des Gardes (winter and summer ski resort) and the plateau de la Verrerie, Eric et Anne-Laure welcome you at the friendly campsite Les Myrtilles set in a beech forest.at 1000 meters above sea level. The reception is open every morning from 8.30 am to 12h and afternoon from 2 pm to 7.30 pm. Since 2013, the Camping-Auberge Les Myrtilles has been a member of the European Institute of Reception and Customer Services. Our main purpose is to provide customers with the best services ! The pool is open only for our guests from 10 am to 7 pm. Children are under the responsibility of accompanying adults. Special night walks for all ages starting from the campsite These hikes are planned just few days in advance depending on the weather and the number of participants. Once a week, on Saturday or Sunday, Eric offers you a welcome drink and a tasting of his speciality. Volleyball for children and grown-ups! Badminton for children and grown-ups! Tennis : rackets and balls available at reception, we set the height of the net for you. Petanque balls and different games like Molky are also available at the reception. You will just have to bring back the material so other clients can used it after. There is a ping pong table on the playground. It’s the perfect opportunity for parents and children to have a great time together ! If you don’t have your own equipment, we loan rackets and balls at reception. To connect, look for the access point on your device and pay online via extranet connection. Area with tables chairs and two barbecues. Hair dryer and iron available on request at the reception. Do not hesitate to ask us what you need and we will do our best to satisfy you ! Whatever the occasion, come and enjoy our quality facilities for your group stay in the Allier. Individual accommodations for everyone (even for big groups) in a unique natural setting. 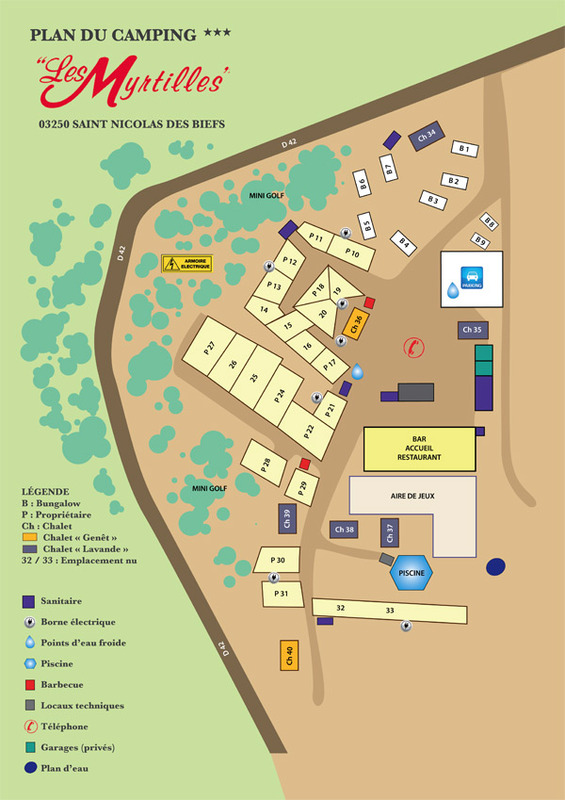 Tourist guide, hiking maps, walks and cycling near the campsite and in the Allier. Look no further! You have found the ideal place to organize all your events and private parties. We also welcome group throughout the year in our restaurant ( family gathering, seminar…). Half board or full board catering for groups by reservation. The restaurant will be open every day for lunch from July 7th to August 31th. Les Myrtilles is a bar and a restaurant offering home-made food and good portion size and delightful cuisine ! Packed lunches are also available. In summer we also serve breakfast for campsite guests, only by reservation the day before. Book your next holidays in the Allier now ! Set on 2 hectares area , the campsite Auberge Les Myrtilles offers 7 chalets, 7 bungalows, 10 quiet and spacious pitches for tents, caravans and motorhomes, as well as a restaurant with tasty local food and friendly service.